More than any other question that I get from friends and readers is how to make a great chicken soup with matzah balls. Chicken soup is universal, comforting and enjoyed year-round, as opposed to some traditional Jewish foods that are enjoyed only at a particular holiday. READ: What’s the Difference Between Matzah Balls and Kreplach? It’s not complicated if you follow a few easy steps, and this year we decided to help out even further by making a short video to help take away the mystery of making perfect chicken soup every time. We love debating sinkers versus floaters when it comes to matzah balls, right? Well I am firmly in camp fluffy. (If you’re in camp sinker, try this recipe.) How to make fluffy matzah balls for your soup? Roll them very gently in the palms of your hands, make sure to wet your hands with ice water in between rolls and don’t forget the schmaltz. 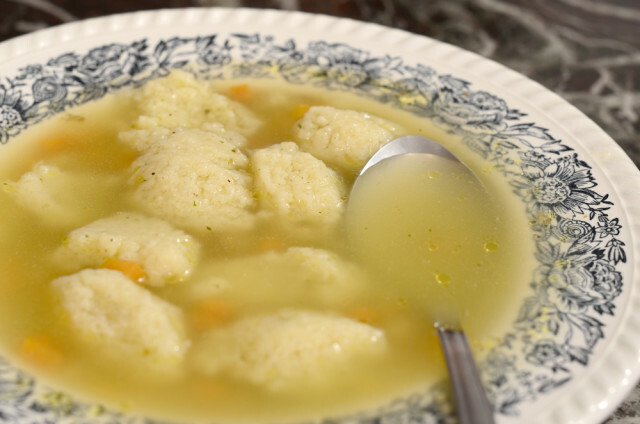 Or you can watch this video to help make the perfect fluffy matzah balls to go with your chicken soup. For more matzah ball recipes, including potato matzah balls and healthy matzah balls, click here. Place chicken and vegetables in a 16 or 20 quart pot and cover with 6 quarts of water. Make a bouquet garni with the fresh dill, parsley, peppercorns and thyme. Add bouquet garni to pot. Bring pot to boil and let simmer for 1 hour. Skim the foamy stuff off the top several times while soup is cooking. Remove chicken and veggies from pot. Allow soup to simmer additional hour with the cover on. Shred chicken while still warm. Save about half to put into the soup, use the rest for chicken salad or sandwiches. Allow soup to cool, and place in fridge. Skim any remaining fat off the top. Reheat to serve. Add chicken, matzah balls and desired vegetables.